UTOL was born not from the heart of man but from the heart of God who made the heavens and earth, “And we know that all things work together for good to those who love God, to those who are called according to His purpose“( Romans 8-28 ) and that His name maybe glorified. For the Lord has shown to me that His word is alive, For He does not change yesterday, today and forever. He is a good God and His love for us is forever lasting. As a young medical student, I went through a lot of difficulties and trials. My Christian life was going through the motion of ups and down. I eventually learned about the relationship with God when I was watching the 700 Club and became very interested in the show. Moreover, I eventually learned about the Jesus is Lord Fellowship through the television and started to attend a Christian Organization in our campus. However, when I was in my final years of medical school, pressures in my studies gave me less time to attend to, and interact with, the Christian group. Because of the schedule of our duties, our group was not able to meet regularly. I did not realize then that I was still a babe in Christ. As I was preparing to leave for Davao, I first attended the Sunday service of Jesus is Lord Church at the Quirino Grandstand. There was a preliminary workshop or bible class prior to the service. I approached the bible teacher after the workshop and asked her assistance to approach Bro. 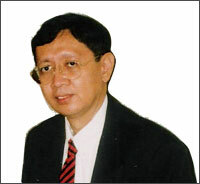 Eddie Villanueva, the spiritual director of JIL. It was my desire to bring Bro. Eddie over to Davao City , so that he can pray over my father for healing. The bible teacher responded by telling me that Bro. Eddie is not the healer, and it is Jesus Christ who heals. I was then instructed to look for the senior pastor, Manny Esguerra, in Davao City and inform him of my situation. The bible teacher then led me to James 5:14 –16, “Is anyone among you sick? Let him call for the elders of the church, and let them pray over him, anointing him with oil in the name of the Lord. And the prayer of faith will save the sick and the Lord will raise him up. And if he has committed sins, he will be forgiven.” Several verses in the bible were shown to me regarding healing. I was completely filled with faith in God’s word. At this time, I completely trusted the word of God that, after I have followed God’s word in the bible, everything will be alright. I sought the help of my aunt for a plane ticket to Davao because I did not have any means. Together with my girlfriend, and eventually my wife Amelie, I decided to go to my aunt Nena Pardo and explained what happened to my father. She instructed me to go to Mr. Jun Funk, who is a good friend of our family and a senior officer of the Commonwealth Foods head office in Makati, where my father was once connected as a general manager. Mr. Funk, after listening to my story, offered me a boat ticket to Davao. However, I politely rejected the offer and insisted that I need a plane ticket because it was almost a week since my father was in the ICU, and I might not see him alive. I was instructed to go back to my aunt who gave me the money to buy a one-way ticket to Davao plus a pocket money of P3,000. I believe that she did this after confirming my father’s condition in Davao Doctors Hospital. She also instructed me to look for a family friend in Davao if I were to need further assistance. I praise the Lord for His wisdom because He made a way for me to go to Davao. While I was on the plane to Davao City, I opened my bible and read Psalm 23, “ I am the good shepherd…” I kept on reminding the Lord of His promise in the bible. I was so eager to be in Davao because I was expecting a miracle of healing of my father to happen after the anointing of oil. As the BAC 111 jet touched down in the airport in the late afternoon, I hurriedly took a taxi to Davao Doctors Hospital and proceeded directly to the Intensive Care Unit to check if my father was still alive. I was so happy to see that he was alive although he was hooked to a life sustaining machine (respirator machine). After asking the permission of the nurse on duty to come closer to my father, I greeted him with a kiss and whispered at his ears that I was already there at his side. The nurses informed me that they were looking for a close relative for several days but was apparently told that he does not have a single relative in Davao. My father has decided to stay in Davao after his retirement from Commonwealth Foods and my family got separated and eventually immigrated to the United States. I learned that Atty. Capili has been the only guardian who attended to my father’s well being. After seeing that my father is alive, I immediately looked for the JIL Church in downtown Davao. As I entered the church, I introduced myself to Pastor Manny Esguerra and the two other pastors present. I then explained to them my urgent request for them to pray over my father with oil as it is written in James 5:14-16. We prayed for the Lord’s blessing and wisdom, and we thanked Him that He has heard our prayers, and we gave back all the glory and praises to the Lord. When we arrived at Davao Doctors Hospital, we proceeded at the ICU. We gathered around the bed of my father, noting that he was in deep coma. We prayed over him, and Pastor Manny Esguerra anointed him with oil on his forehead. After he was anointed with oil, I expected an instant miracle and waited for my father to wake up, extubate his endotracheal tube, get up and walk home. But to my surprise, it did not happen! I asked the Lord in my heart why His promise in James 5:14-16 did not happen even though I followed His Word faithfully. I could not understand why my father did not wake up. I thought that, maybe, I might have missed something or I have not yet followed God’s command in His word. The pastors left and I thanked them for granting my request. I did not lose hope and continued to trust the Lord. I read the bible everyday, specifically Psalm 23, into my father’s ear and continued doing so until I was dead tired. I had only approximately 4 hours of sleep per day for at least a week. I did not have any relative to relieve me from watching over my father so I did all the nursing care, from the sponge bath, changing his diapers, suctioning of the endotracheal tube and shaving his beard daily for almost 2 weeks. I was perpetually at his bedside day and night, only leaving to attend to my personal hygiene. I have experienced caring for my patients at the hospital as an intern so I told myself that I can do it better for my father. When I grew tired of reading Psalms 23 from the bible, I would put on a Christian tape and played the music into his ears. In the first week, I saw that the ICU room was full house with approximately 5 beds. I also noted that my father was the oldest of them all, being 80 years old already. Yet, I witnessed people dying left and right. Through it all, I felt that God’s word in Psalm 23:4 was more alive, “Yea, though I walk through the valley of the shadow of death, I will fear no evil; For you are with me; Your rod and Your staff, they comfort me.” I kept on asking the Lord as to when all His promises in His word will come to pass. I eventually let go, and trusted my father’s life in His Hand. Our family friend Atty. Felipe Capili advised me to prepare the documents of my father’s memorial plans. But I could not personally accept that idea because I was hoping for the Lord’s healing and I have trusted God’s word. I felt that my faith was really tested during these times when everything seemed hopeless. First, based on the things that I saw and heard and my medical knowledge regarding the physical condition of my father, he was physically dead and the doctors told me that he only has less than 10% chance of survival. Secondly, our family friends were not at all optimistic because I did not have the funds to support my father’s hospitalization. However, I refused to look at all these odds which are against me, but instead, I choose to trust on the Word of God in the Bible. After a week, a young nun approached me and asked me what I was reading in the bible. Her father was also in the ICU, just across the bed of my father. I did not know that she was watching me and she saw that my father was improving. I shared to her James 5:14-16 and Psalm 23. She eventually called the priest and anointed her father with oil, but unfortunately after a week her father passed away. The following morning, the medical director of the hospital called me to his office. I was expecting that he would advise me regarding our hospital bills. But to my surprise, he told me not to worry about the hospital bills anymore because there were two anonymous persons who are willing to shoulder all our hospital bills, no matter how long we stay in the hospital. I thank the Lord for the blessings and realized that God’s Word is true, “even before you ask, He knows your needs”. The Lord was revealing to me that His Word is true. The doctors of my father advised me that there is very little hope for my father’s survival and I responded that I will trust the Lord for His healing. I know that medicine has its limit so I requested that they continue all the medications of my father. On the 2nd week, I saw tears from my father’s eyes every time I would read Psalm 23 to him. I became excited to see all these things and knew that he was hearing God’s word and his spirit is alive. Gradual improvement was noted at the end of that week. He spontaneously opened his eyes and, as I saw this, I thanked the Lord for all the things He has done. Truly, God’s promise is true and He is never late, ” God is not a man that He should lie , nor a son of man, that He should repent. Has He said, and will He not do it ? Or has He spoken, and will He not make it good? “( Numbers23-19 ). Being a medical doctor, I had the privilege of reviewing the medical records of my father. Through my examination, I noted that my father was not given priority upon his admission to the emergency room. He was not in coma when he entered the hospital; it took them several hours to give him medical attention. When my father arrived, he was complaining of severe dyspnea or difficulty of breathing associated with pinkish frothy discharge coming out from his mouth. The diagnosis should have been pulmonary edema with congested heart failure, which is an emergency, life-threatening condition. I found out that no immediate action was given and the resident doctor on duty waited for my father to go into respiratory arrest, and eventually coma, before he was given the appropriate management. However, the Lord was speaking to me to forgive this doctor and in my heart I forgave him. Eventually, I confronted this doctor and, after hearing his story, he admitted his mistake for the delay in management and asked for an apology. In 2 weeks time, our hospital bill was more or less P50,000 since the ICU rate during those times was approximately P5,000-6,000/day. My father’s status was reversed from coma to fully conscious by the end of 2nd week, although he remained quadriplegic and could not speak. We were eventually transferred to a private room. The doctors could not believe that he survived, much more that his coma was reversed. I continued to praise the Lord and read the bible, especially the whole New Testament because I was searching continuously for God’s promise. For our three-months stay in the hospital, our bill amounted to P150,000 excluding the doctors fee. We stayed in the hospital with daily physical therapy for rehabilitation. I continued to wait and ask the Lord for His perfect time for my father to walk. So, after the end of the 3rd month I was getting impatient, I requested from the medical director that we be discharged from the hospital. My plan was to continue his full recovery in Manila. I felt that I needed to proceed with my plans to be a licensed doctor. However, the medical director advised me that I should not be in a hurry because my father was still recovering. I said to my self that I was truly blessed and the Lord is so great that even though I do not have any money, the Lord provided all my needs. I continued to praise our Lord Jesus because even the cashier of the hospital was surprised to find out that she was receiving many checks coming from different people for the support of my father’s hospital bills. Truly the Lord has provided all my needs even before I ask. My father was a retired General manager of Commonwealth Foods Inc. and even the head office in Makati send their support by issuing a check to cover all bills from day one to the present. I continued to praise the Lord for all the blessings. I never run out of money, it was always provided by the Lord. Exactly after one month in Cavite where I brought my father for recovery, I realized that I was not able to give a good nursing care for my father, unlike when he was in the hospital, medicines was given on time, daily physical therapy was done. All of the comfort and care were no longer possible. The Lord has taken him away exactly after 1 month, and I cried to the Lord and ask Him why has he taken my father however the Lord spoke to me in a soft voice that I was not able to carry out all the obligations of caring for my father. He eventually passed away. There I realized that the Lord was teaching me how faith works, it needed three ingredients, Love, action and patience. I realized the Lord was revealing that He was still dealing with my patience. The Lord has given me the gift of experiencing of how faith works and thru those years I carried thru that gift of faith in my heart. Although, thinking that God has been finished with me and never imagine He will lead me to another ministry that is close to His heart and mine, that is to attend to the health needs of our pastors and Christian brethren, to show that we must love for one another as the Lord Jesus Christ commanded, let us not just love in words but in action. 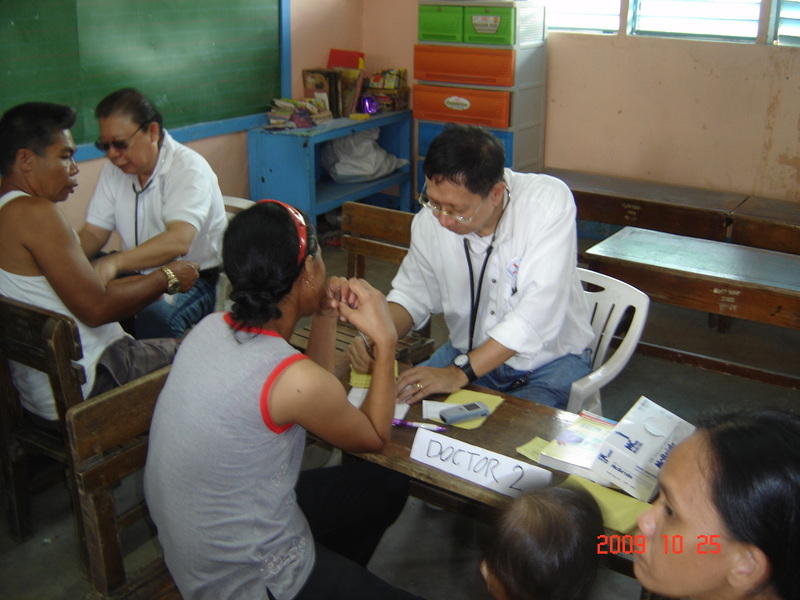 After 6 years I was having my residency training in the department of Internal Medicine in Quezon City Medical Center. Here I met several pastors at emergency room and in the hospital wards and so their burden of paying their hospital bills worth in amounts of P2,000-60,000. I said to myself that this pastors have given their life to the Lord and some of them have given up their profession to serve the Lord, yet after they get sick or their family gets sick, no one seems to care for them, I can identify their burdens and their need. I told several pastors that we should organize the church and form a benevolent health assistance program, eventually the Lord has lead me to the brothers keeper in the internet and was able to get an idea on how to create a program for our pastors and the body of Christ. For the last three years we had several meetings done in a weekly bases which was composed primarily by pastors but knowing that our pastors did not have the know how on the health program, the Lord lead me to continue in sharing God’s vision to Christian doctors, lawyers, businessman, in building a state of art hospital, place it in the best place for the Lord, create satellite clinics in all region of the country and organized a Christians doctors of the Philippines for Christian patients. And so UTOL( Universal Touch Of Life Medical Foundation ) was born. Let us give all Glory and Honor to our Lord Jesus Christ for UTOL Medical Foundation was truly born from the heart of God. MANUEL S. STA. ROMANA, JR., M.D.